Follow this procedure when a customer comes in to pick up their repaired iOS (iPhone, iPad, or iPod) device. The customer will arrive to pick up their iPhone, iPad, or iPod after they have been notified that their device is ready for pick up. Ask the customer for their name, then retrieve their device from the designated "iOS Device" shelf located in the tech room. If it was placed in a loaner phone: retrieve the SIM card from the loaner phone and place it back into the original repaired device (or into the replacement device if their original phone was replaced). CHECK BACKUP STATUS: Look at the SRO notes in the “Problem Description” field under the “Backup Status” line, to see how/if a backup was done for their device, prior to the repair. RESTORE: Turn on the repaired or replacement device and start the restore process from the backup if one was completed prior to the repair. This will either be a restore from a local iTunes backup (if we have the backup on a local computer) or through iCloud. Depending on the size of the customer’s backup, this process may take a decent amount of time. It is important to keep the customer informed regarding the length of time the restore will take, and keep their expectations realistic. In most cases, it is better to give the customer a longer estimated time than what may be projected on the iOS device screen during the restore process, as it will help account for possible hiccups during the restore process. The customer can leave while the initial portion of the restore process completes and return when it is completed. The customer can start the restore process themselves when they get home (as iCloud restores require a WiFi connection). If it is late in the day, and the restore will not finish before we close, you can place the SIM card back into the loaner phone (if one was originally issued), and the customer can return the following morning to pick up their device. Keep in mind that if the customer does choose to return at a later time, it is very important to overestimate time frames, as failing to do so may result in more return trips for the customer than necessary, which can be very frustrating from their point of view. Once you have reached the second stage of the iCloud restore process, the customer can safely leave the store as long as everything was checked out. 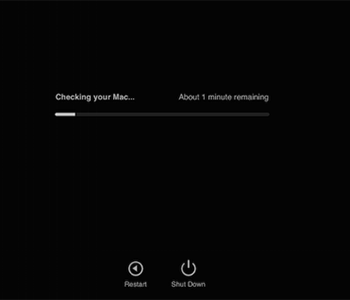 Even if all the data appears to have been completed, you can check to see if the restore is still in progress by navigating to “Settings,” “iCloud,” then “Backup.” In the “Backup” window, if the iCloud restore has not completed you will see a message letting you know that the restore is still in progress. Be sure to explain to the customer that the complete restore make take more time and show them in iCloud how to know when the restore is finished. It is also important to explain to them that when they get home they will have to put their phone back on WiFi to continue the restore process. Explain that sometimes a restart of the iOS device may be required to continue the restore. CHECK DEVICE: Once the restore is completed, be sure to check over the device with the customer. You’ll want to confirm that all the applications have completed downloading, as well as photos. Also make sure to confirm that email is working for both sending and receiving, as often, even with iCloud keychain enabled, passwords for email accounts tend to require re-entry after a restore from a backup. Double check settings to make sure things look setup properly (IE: Messages, FaceTime, iCloud). LOANER: If the customer was issued a loaner phone, let them know that as part of the return process for the loaner device, we will be securely removing their data from the phone. Be sure to ask them if there are any messages or photos they have taken while they have had the loaner, that they may want or need to save before we erase the device. If there is information they need to save, make sure to offer your assistance to help them with the process, such as emailing or messaging photos to their own account. If there is no data that they need from the loaner, precede with the erasing process. Access the GeekHampton Intake App and select the Loaner Return tab, put in Time Stamp, Printed Name, have customer sign the app and you put in your initials. Follow this procedure when a customer comes in to pick up their repaired computer device. Customer comes in and says they are here to pick up their computer. Ask the customer their name and what type of computer (laptop or desktop) and go to the tech room and find the computer on the shelf. Look at the SRO and see what has been done with the computer before you leave to the tech room, ask the techs if there are any questions. Take the computer out to the customer. If it is a laptop automatically turn it on and show the customer what has been done. If it is a desktop ask the customer if they would like to look over the computer and, if so, put it on the GeekBar and set it up to show the customer. If there are any “Pickup Notes,” please go over the notes with the customer. Check LightSpeed for payment. If no payment has been made, take the customer's payment at this time. Once they approve the work that has been done on their computer have them sign one of the invoices and then you initial the invoice yourself. Bring the signed/initialed invoice and SRO back to the tech room and file it in the appropriate folder by the door. A Service Request Order (SRO) is created for all iOS devices accepted for repair at GeekHampton. Use open-ended discovery questions to develop a complete understanding of the issue the customer is having with the iOS device. Open-ended questions require detailed answers rather than just “yes” or “no.” Refer to the “Intake Questions and Verification” policy and procedure for a list of questions to ask. Run Apple Service Toolkit (AST2) diagnostic tests (mandatory). Refer to the “Apple Service Toolkit (AST2)” policy and procedure for instructions on how to run this test. If unable to run any diagnostics, bring to tech room to run SNR and HDI using provided tools. It is mandatory to get HDI run on ANY iPad or iPhone that you cannot run diagnostics on. Communicate rates and turn around time to customer. Give the customer the rate of the repair and go over the turn around time for an iOS repair. Please give proper expectations. AppleCare+ devices should be repaired in 1 to 2 business days. If the repair is setup on a Saturday it will not arrive until at least Tuesday. Mail in repairs take 3 to 5 business days. Explain that the weekend is not included in these dates. For screen repairs, talk to repair tech to get an estimated time frame for displays, batteries or other part repair on iOS devices. Critical: Do not make any promises regarding turn around time. Every customer must be told the following regarding turn around time: Record the estimated date of completion on the SRO and explain to the customer that the tech department will call them when the device is returned. Give the customer GeekHampton’s current business hours. Login to LightSpeed create an SRO with the SRO (wrench) button. Ask the customer if they have had a computer repaired or have purchased equipment at GeekHampton before and, if so, search for them by entering their last name in the “Customer” field as shown below. Confirm the name, phone number, and email address we have on file. Please confirm the spelling of their name. If they only have name or name and email please fill in the rest of the information. Name, Phone, Email and Address are mandatory on all repairs. Please confirm the phone number by reading it back to them (even if they just gave it to you or if it was already in their record). Add new customers to the system being sure to enter their name, phone number, email address, and billing or shipping address. Read the information back to the customer to confirm it has been entered correctly. Search for customer by entering their last name in the Customer search field. Enter the serial number of the iOS device to determine warranty status. Once the serial number is entered, hit the return key on the keyboard. If the device can turn on go to Settings to General to About and record the serial number. If the serial number is cut off, hold your finger down on the serial number, hit Copy and then Paste it onto Notes so you can get the full number. Always use the SNR tool on all applicable devices at the GeekBar for iOS to ensure the correct serial number is pulled from the unit. All serial numbers are entered in CAPITAL letters. Critical: Once the serial number is entered, hit the return key on the keyboard. LightSpeed will then pull up the model and warranty information on the unit. If no information is returned, double check that you have entered the serial number correctly. Communicate the warranty status of the machine to the customer, if they disagree about the warranty, check to make sure you are entering the serial number correctly. Enter the following information into the “Problem Description” field. Use command + “,” to pull up the phrase list and select the issues listed. Enter the issue as described. Use command + “,” to pull up the phrase list and select the issues listed. Use the filemaker intake app to record the condition of the device. Enter results of the AST2 test (if applicable) and if you were not able to run AST, please note that. Enter the passcode of the device. Critical: Please test the passcode if possible. If the work on the iOS device requires an Apple ID (e.g., backup and restore) enter this information on the SRO and verify (verification can be done by going to either icloud.com or appleid.apple.com). If two factor is turned on note this and explain to the customer what this means. Customers can backup their iOS device using either iCloud or iTunes. It is important to ask the customer whether or not they have a current backup of their device. Even if the customer says they have a backup, it is important to double check and confirm that this is true. For iCloud, make sure the device is connected to a wifi network, then navigate to their “Settings,” “iCloud,” then “Backup” on their device. Even if there was a backup from this morning, attempt to create a backup with them at the time of intake. If their backup is on a computer note where (e.g., "customer's computer" or "GeekHampton's MacBook Pro"). Put the serial number of this MacBook Pro in the “Backup Status” line in the “Problem Description” field in the “SRO” window. Unfortunately, with iTunes backups, unless we do the backup here locally, we cannot check to see if one was completed unless they also happen to have the computer that they sync their device to with them at the time of intake. Please note that iCloud backups are the preferred method for iOS devices, as they can be done without being connected to a computer, and have the tendency to be much more current, as they are automatic (as long as the criteria is met). By explaining this to a customer, they will be much more likely to want to pay for additional iCloud storage to have a current backup, if lack of space was the reason a current iCloud backup hadn’t been completed. If the phone does not turn on and they know their iCloud login information you can go to icloud.com on a computer or another device, and check to see if they have a recent backup. If they do not, please note and explain to the customer that without a backup, or a current backup, they will lose data during the repair process, as it is standard procedure for Apple to wipe iOS devices for testing purposes, during the repair process. Go to Filemaker intake app and check the appropriate backup fields, and have customer sign the app. Turn off “Find my Phone” and note this on the SRO, if necessary. For battery and display replacements this is not necessary unless the repair turns into a full unit replacement or mail in. Set up loaner if needed. If the customer is eligible for a loaner device, and requires one, go to the tech room and retrieve the proper Carrier-specific loaner phone that matches the customer’s phone service. Ask a technician if you are unsure of which loaner to choose, or are having difficulty finding a loaner phone. Go to the filemaker GeekHampton Intake App an fill in the Loaner Setup Tab. Swap the SIM card from the damaged phone to the loaner phone. Explain to the customer that the loaner phone will not contain all of their information from their phone being repaired as our loaner phones are of smaller storage capacity and generally will not accommodate a full restore from their backup. Be sure to set realistic expectations for the customer about the repair process. Mail-in repairs generally take about 4-5 business days (business days do not account for weekends when the depot is closed and FedEx does not ship). Whole unit replacements are typically overnight during the week, but may sometimes be delayed due to lack of stock, or if the repair was setup on a Saturday, so be sure to explain the possibility of an extra day of turn around. Although we will not do a complete restore to the loaner phone, we will, however, help them setup their email accounts as well as Contacts, only if the contacts are attached to iCloud or one of the email accounts. Be sure to explain to the customer when we receive their iPhone from Apple, after the repair has been completed, we will assist them in restoring their content from their most current backup (which is generally the one completed in the store during the repair setup process). Turn on the phone and sign in with the customer's Apple ID. Go through the basic setup. Go over use of the loaner phone with the customer before they leave. Make a note on the SRO how you set up the phone (i.e., setup as a new phone, restored from iCloud). If you have given the customer a loaner phone make a copy of the Credit Card and charge the customer for the repair. Explain to the customer that we are charging them for what we expect the repair to be. If Apple gets the phone and “Requotes” the repair we will call and notify them of the change so they can decide if they want to proceed with the repair. Ask the customer to review the SRO for errors and sign it. Ask the customer if they would like a copy of the SRO (they do not need this to pick up their device from repair). Give the customer a copy of the SRO. Ask customer to verify the contact information. If additional information needs to be entered in the SRO after it was signed, edit the SRO “Problem Description” or “Internal Notes” to reflect the changes, print out a new copy, and staple it to the original. Critical: DO NOT handwrite notes on the SRO. Handwritten notes cause many communication issues. Always document on the electronic SRO. Please refer to the “SRO Documentation” policy and procedure. Give the iOS device to someone in the office or one of the techs to setup. Give them the SRO, LoanerAgreement and the Credit Card copy if there was one, these should all be stapled together. A Service Request Order (SRO) is created for all machines accepted for repair at GeekHampton. Use open-ended discovery questions to develop a complete understanding of the issue the customer is having with the machine. Open-ended questions require detailed answers rather than just “yes” or “no.” Refer to the “Intake Questions and Verification” policy and procedure for a list of questions to ask. Run Apple Service Toolkit (AST) diagnostic tests (mandatory). Refer to the “Apple Service Toolkit (AST)” policy and procedure for instructions on how to run this test. Give the customer a current rates sheet and tell them a technician will call them with an estimate for the repairs. Tell the customer about the diagnostic fee. Do not quote any price for the repair. Repairs vary widely, and repair time can vary as well. Ask the tech dept what the current turn around time is. Record the estimated date of diagnosis on the SRO on the Options tab and explain to the customer that the tech department will call them when they have diagnosed the issue. If the tech department is running behind on the stated diagnosis date, they will contact the customer. We put the date of estimated Time on the SRO the tech dept calls the customer when they get to that repair. If they are running behind the estimated date then they touch base. Ask the customer if they have had a computer repaired or have purchased equipment at GeekHampton before and, if so, search for them by entering their last name in the “Customer” field as shown below. Confirm the name, phone number, and email address we have on file. If they only have name or name and email please fill in the rest of the information. Name, Phone, Email and Address are mandatory on all repairs. Please confirm the phone number by reading it back to them (even if they just gave it to you or if it was already in their record). Enter the serial number of the machine to determine warranty status and communicate the status to the customer. The serial number of Apple products varies by machine. Please refer to reference sheet, “Locating Serial Numbers” if you are unsure of where to find the serial number. LightSpeed will then pull up the model and warranty information on the unit. If no information is returned, double check that you have entered the serial number correctly. If information is still not returned then the machine is legacy (e.g., G4) and is not covered under warranty. If no information is returned, enter the machine information yourself in the description field. Use descriptive words and refrain from using generalized adjectives or slang. For example, rather than saying, “The trackpad is wonky” use “The trackpad does not track properly” or “The trackpad button does not depress.” More information is better than less. Be as descriptive and precise as possible. Enter results of the AST test (if applicable). Enter the admin username and password of the machine. Critical: VERIFY the password before the customer leaves: Go to System Preferences, Users & Groups or Accounts, and attempt to unlock the System Preference pane by clicking on the lock icon in the bottom left corner of the window. Enter the password the customer gave you in the window that pops up. If the customer does not know the password, let them know we can reset the password. Critical: Explain the drawbacks to doing so—any saved passwords in their keychain (banking login, saved email passwords, etc.) will be lost and have to be re-entered. Document in the “Printed Notes” that they do not know the password and have agreed that the password can be reset if needed. If the work on the machine requires an AppleID (e.g., system upgrades or installing software from the App Store) enter this information on the SRO and verify. In addition verify if it has 2 factor verification and explain to the customer what this means. Note any physical or cosmetic damage to the machine by entering in the GH Intake App. The Problem Description field of the SRO. Power cables for Apple products should NEVER be taken in, unless they are critical to or linked to the repair. If the customer has to leave a backup drive, or any peripherals necessary for the repair (power supplies for backup drives, mouse or keyboard if linked to the issue, etc. ), be sure to check the corresponding boxes in the “Additional Items” field, and note the items in the “Problem Description” field. Be sure to describe the items checked in, and note the make and model if possible (e.g., Black LaCie drive). Please refer to “Intake and Labeling of Additional Items” policy and procedure for more information. Take a deposit for out-of-warranty computers. Please refer to the “Diagnostic Deposit” policy and procedure. If no deposit required, proceed to saving and printing out the SRO (see attached example). Ask the customer to review the SRO for errors and sign it. Give the customer a copy of the SRO. Ask customer to verify the contact information. Put the store copy of the SRO in the bin on the wall next to the door in the Tech room. Put it in the back of the other SROs in the bin. The Tech’s pull from the front, so it is important to add new SROs to the back so the repairs are done in order by date. All GeekHampton employees ask customers the following standard list of questions and complete these verification steps when accepting machines for service or repair. Many of these questions are excellent opportunities to offer products or services such as hard drives for backup and system upgrades. Always consider the whole picture of the customer’s needs when taking in a device for repair. Do you have a recent backup? Verify: Check the date in the Time Machine icon in the menu bar (on machines with newer operating systems, the Time Machine menubar icon may be hidden by default) or on the actual backup drive in the backup folder. If they do not have a backup, explain the importance of having a backup and discuss backup products and services offered by GeekHampton. What is your admin username and password? Verify: Go to System Preferences, Users & Groups or Accounts, and attempt to unlock the System Preference pane by clicking on the lock icon in the bottom left corner of the window. Enter the password the customer gave you in the window that pops up. Verify: If using a computer, go to applied.apple.com to verify. If using an iOS device, go to icloud.com to verify. You can also verify by logging in to iTunes if you are not able to login using the previous methods. NOTE: If installing a new OS through the App Store (Lion and newer), the customers AppleID is required. If the customer has never purchased anything from iTunes or the App Store, they may be required to re-enter their security code on their credit card. If possible, start the purchase of the software needed while at the GeekBar. This will bring up any potential problems with the customers AppleID and the issues can be addressed easier with the customer nearby. Do you have important software that you use regularly on your machine? Critical: Check for incompatible software on the machine even if customer says they do not need the software. Sometimes the customer answers that they only use the program once in a while; explain to them they will NEVER be able to use this software again (e.g., Palm Software or Appleworks). Verify: If you are unsure whether an application is compatible, go to http://www.roaringapps.com to check. Please have Sheryl, John Theret or Jarred look over the SRO before the customer leaves. Ask them thoroughly what they use on the PC. Where do they check their email? Do they want their bookmarks? What programs do they use on the PC? If the computer was not purchased with us, ask: Has the new machine been used yet? It is easier to do a transfer to a new machine than one that has already been used. If it has been started, ask the customer if there is anything important on the new machine already. Explain that if they have used the machine already and items have been saved to it, they will end up having a second user account. It’s important to discuss this with them in advance so they are not confused when they get their computer back. What information would you like to have transferred? Applications, specific users, specific libraries (iTunes, Photos) all data, or just a specific folder or file? What is your admin username and password on both machines? If customer is transferring to a new OS, ask: Do you have important software that you use regularly on your machine? Verify: To check for software incompatibility, go to System Profiler (or System Information on Macs with Lion 10.7 or higher). Click on “Applications” in the sidebar. Sort list of applications by type. If the computer is upgrading to anything beyond Snow Leopard 10.6, any apps that are “PowerPC” will no longer be compatible. Any apps listed as “Classic” probably do not currently work and should be pointed out to the customer as non-functioning. Critical: Make sure the customer understands that all data and software will be lost from the current state of the machine. What would you like your new username and password to be? Do you have any other requests such as installing a newer operating system or particular software after the computer is wiped clean? Critical: Do not try to power on the machine as you can damage the machine further if the interior components are wet. Ask the customer if they tried turning on the machine after the spill. Critical: Ask the customer when the spill happened. If it has just happened minutes before coming in to the store take the computer to the Tech Department immediately and ask a tech to look at it. Critical: You cannot run diagnostics on a computer with a liquid spill because you can’t power it on. Do not try to turn it on. Critical: Explain to the customer that accidental and liquid damage are not covered under AppleCare limited warranty but is now covered under AppleCare+. Critical: Liquid damage repairs require a deposit, even if they have AppleCare+. The only exception is if they have purchased GH+ or if a manager determines no deposit is required. Please see “Diagnostic Deposits” policy and procedure for more information. All other repairs should proceed with the normal SRO intake process. Please see “Setting up an SRO” policy and procedure for more information. Do keep in mind that by resetting the SMC you will lose power specific settings, like the time it takes to sleep a Mac and other customizations to power settings. No big deal, but if the computer does not turn back on you should mention to the customer that if they have made any changes to their hardware behavior you will want to adjust these settings such as sleep behavior again. The boot time after resetting a machines SMC can be a bit longer than usual, that is normal. Accurate documentation while servicing a customer at the GeekBar is imperative to customer satisfaction and future servicing of the customer. All account information, passwords, and usernames are documented in both the LightSpeed invoice and 1Password. While you are working with a customer, use a notebook, iPhone, or computer to keep track of account numbers, usernames, passwords, relevant events that happen on the machine, and any other important aspects of the interaction. This will eliminate having to try to remember events and information after the customer leaves. Do not leave your notes lying around; always protect our customers’ information. When finished servicing the customer ask them if it is okay for you to enter their usernames and passwords into our system. Explain the “Geek/Client Privilege®” and assure them that we take their privacy and security very seriously. With the customer’s permission, enter all pertinent information (account numbers, passwords, usernames and events) in the “Internal Notes” field of the Lightspeed invoice. Example: Customer asked to change their Apple ID password because it was not working when they came in. We explained ramifications of changing passwords on one device without changing it on others. Enter passwords, usernames, acct numbers…. Enter passwords, usernames, account numbers, etc. in the “Notes” field and initial and date the entry. Follow this procedure when switching a customer's email account from POP to IMAP. Communicate information about mail server type (IMAP or POP3) to customer. Need to be aware of how large the mailbox is because all messages remain on the server. Optonline is now IMAP too but it has a very small mailbox (2GB as of 2017). All email messages, along with any attachments, are downloaded to users computer for viewing. Depending on program configuration, these messages may be automatically deleted from the server once it is received, or at some future time. Messages sent, moved, or deleted from a computer using POP can only be viewed on that individual computer's folders. They cannot be viewed on other computers connecting to that email account, including Webmail. POP3 is an old email server type and is not recommended for users, but when moving people off of it to IMAP one must explain what the difference is. If your email account is a POP account, messages read, deleted, or moved, DO NOT mirror the changes to the same account setup on another device. You can configure a POP email account to keep on server or remove from server, but if you send an email from the server, from a computer, or from an iOS device you will not see these sent messages on the other device unless you have CC’ed or BCC’ed yourself when sending the message. This is why many people when they first got their iOS devices they automatically BCC’ed theirselves on all emails. If you have an IMAP email account, and it set up as correctly on your devices, whatever you do on one it will replicate on the other, as the messages are stored on the server, and you are making global changes to those messages. CRITICAL: Before you delete the POP email account from the computer, you must backup the email boxes to the "On My Mac" section of the computer. If you are only making the change on an iOS device explain to the customer that when the email account is removed from the device, all of their email history on the device will be removed. This is important to make aware to the customer, as past sent emails, drafts, etc. will no longer be accessible. If they do not want that to happen do not delete the POP email account, deactivate it instead, and explain to the customer how they can re-enable the account and reference messages, if necessary. In macOS Mail select “Mailbox” from the menubar and choose “New Mailbox…” from the dropdown menu. Enter a name for the “New Mailbox” (ie: Archive Inbox, Archive Sent Mail, etc.) and make sure you have selected “On My Mac” in the “Location” dropdown menu. Select and drag all the Inbox mail from the POP email account to the Archive Inbox folder. Select and drag all the Sent mail from from the POP email account to the Archive Sent Mail Folder. Once you see that the new folders have populated you can then go into macOS Mail “Preferences,” then to “Accounts” and deactivate the POP email account by unchecking the “Enable this account” checkbox. When you set up the IMAP email the Inbox and Sent box will populate with the emails that exist on the mail server. How you proceed depends on what the customer wants and who the email provider is. If the email provider is Optonline or some other free email service except Gmail, they most probably have a very small server mailbox (2GB). Please find out how big their mailbox is have before moving into the next section. If they have Optonline or one of these small server boxes you will leave the mail in the archived Inbox/Sent mail boxes located “On My Mac,” and explain to the customer how to see their history. If the email provider is Gmail or Zmail or a provider where the mailbox is abundant (Gmail defaults at 15gb, Zmail defaults at 25gb) then you can move the archive mail back to the Inbox or Sent mail or you can move the archive folders you created to the Mail server folder. Please understand that this can take a long time if there is a lot of email to transfer. Explain to the customer what their options are and give them instructions on how they can proceed. Use this procedure to change Apple Mail's Default Sent folder. Apple Mail defaults to a sent mailbox/folder named "Sent Messages". If the option to "Store sent messages on the server" is active it will create a folder called "Sent Messages" on the server and use that folder to save copies of sent messages. This conflicts with many other applications that use the folder "Sent" instead. Open Mail and choose the "Mail" menu in the upper left. Select Preferences. Choose the "Accounts" Tab at the top, then select the account you wish to adjust in the list on the left. Select the "Mailbox Behaviors" tab on the right. Under "Sent Mailbox" use the drop down to select the folder called "Sent". Be sure that it is a folder underneath the header indicating your server-side email account and NOT "On My Mac" (that is a local folder). If you do not see such a mailbox, you will need to create it by choosing the Mailbox menu, then selecting New Mailbox. For the Location field, you must select the correct account to create it under (not On My Mac), then set the name to "Sent". Select the "Sent" folder on the server (in the folders pane on the left) by clicking on it once. It should *not* be at the top of the page next to Inbox/Drafts/Junk/etc, nor should it be under "Local Folders" or "On My Mac". It will be found under a heading indicating that it's a server-side folder. For example: "Websavers" for a Websavers email account. If you do not see a server-side heading in the folder list or if you do and there is no Sent folder there then you must create a new folder by choosing the Mailbox menu, then "New Mailbox". For the Location field, you must select the correct account to create it under, then set the name to "Sent". Choose "Use this Mailbox as" > and then choose "Sent Mailbox"
Choose “Advanced” at the bottom. Ensure that the folder called “Sent” is enabled under the “On the Server” section and is the same one that is being used by macOS Mail. Test the changes by sending a message from each device and showing that they all show up in the same place. Where it says optional leave blank. Do NOT check "Log on Using Secure Password Authentication"
Use the same Username and Password as Incoming or select "Use Same Settings as Incoming"
This is subject to change based on the individual preferences of your ISP. Yahoo mail should automatically set itself up but sometimes there are issues and you have to manually set it up. Make sure SSL encryption is enabled for the incoming and outgoing mail server. 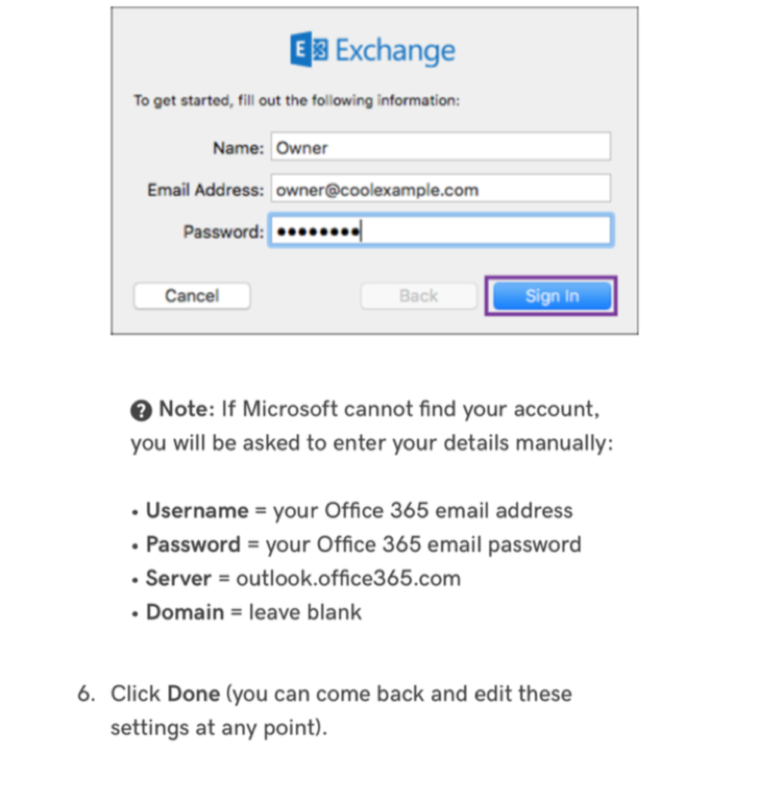 Enter your Office 365 email address and password and tap Next. Wait for it to show verified. Select the services you want to sync to your iPhone or iPad. Open the mail app on your phone to view your new mail account. All GeekHampton employees follow consistent guidelines when configuring email accounts for customers. NOTE: See Moving Email from POP to IMAP procedure for instructions on move an account from POP to IMAP. If this process is taking more than a few minutes to complete, ask a tech for assistance. Make sure you when configuring email you test both incoming and outgoing mail (send to both the customers email and your own, and confirm receipt at both addresses). Login to webmail to check that the password is right if you are receiving an error message. Make sure when configuring you check the sent mail box on all devices that they are all pointing to the same Sent mail folder. All portable devices require the SMTP information to be filled out completely, even if it says optional it is not optional. NOTE: See Moving Email from POP to IMAP: policy for instructions on move an account from POP to IMAP. GeekHampton requires a non-refundable deposit to diagnose out-of-warranty devices. Only management may authorize exceptions to the deposit requirement. The deposit is $50 plus tax, which totals $54.31. Explain to the customer that the fee is non-refundable but will be applied to any work performed (on the machine being diagnosed). $54.31 will go toward the total cost (parts and/or labor) after the machine has been diagnosed and the customer has approved the repair. For example, a customer brings in a computer that has stripes across the screen. The Tech department diagnoses the issue and determines the computer requires a new logic board. The customer approves the repair. A $54.31 credit will be applied to the total cost of the repair. In cases where diagnosis takes minimal time and the malfunctioning computer is not repairable, the Tech Department may choose to offer the customer a credit in the amount of the diagnostic fee toward a new computer at the time of the diagnosis. This offer is at the discretion at the Tech Department only. Sales employees are not permitted to mention or offer this option to customers without the express permission of a Tech Manager. The credit may not be used for purchasing other merchandise now or in the future or applied to any future service or future purchase of a machine. The credit is only good for a new machine immediately after the Tech Department has determined that the machine is not repairable. Diagnostics are added to the “Parts” tabs in the SRO (product code is “Geeks Diagnosis”). Double click on the Product Code “Geeks Diagnosis” to add it to the SRO. The Deposits Tab will automatically open (or click Deposits if it doesn’t open). Payment for the diagnostic fee is entered in the “Deposits” Tab. Credit card deposits are handled the same as any transaction. See below for cash deposits. Cash deposits are not taken at the GeekBar, they must be done at one of the front POS machines. Cash deposits are entered in the "Deposits" section in an SRO by clicking on "Cash." However, they are handled differently than normal cash transactions that are done in invoices because LightSpeed will not automatically calculate the change due to the customer. Do not enter the cash tendered (amount you were given) into the "Payment" field, as the "Deposits" section in the SRO does not calculate change as it would in an invoice. For example: A customer gives you $60 cash. The deposit required with tax is $54.31, which leaves $5.69 due back to the customer. It is necessary for the salesperson to determine the cash due back to the customer either by using a calculator or calculating the change in their head. LightSpeed will not figure this out for you. Enter $54.31 into the “Cash Payment” field and hand the customer $5.69 in change. Do not enter “$60” or the drawer will be off. Critical: Once this is entered in the “Cash Payment” field, it is necessary to click on the “Save” button in the cash payment window, in order for LightSpeed to register the deposit. Always give exact change back so the drawer isn’t off at the end of the day. Once amount is entered in the “Cash Payment” field, it is necessary to click on the “Save” button in the cash payment window, in order for LightSpeed to register the deposit. To diagnose machines that are newer than 2014 run AST2 through GSX. Apple Service Toolkit 2 (AST 2) is a cloud-based diagnostic system to help technicians triage and verify repairs for Mac Computers. AST 2 supports iMac (21.5-inch, Mid 2014), MacBook Pro (Mid 2014), all Late 2014 Mac Computers, and any subsequently released Mac Computers. Follow these instructions to run both the Mac Resource Inspector (MRI) and the Storage Diagnostics (SD) tests. Please first refer to the Diagnostics Procedure before following these steps. In GSX, enter an eligible device serial number and click the Request Diagnostics button at the top of the screen. AST 2 loads on the Diagnostic Console (Mac). On the Diagnostic Console, enter the customer-reported symptom or pick a symptom from the pop-up menu as you type. You may see a list of devices in the sidebar if you are testing other devices or if other devices have been tested. Tap the right arrow next to the symptom description to proceed. At this point, start up the customer’s device while holding down Option-D. Note: If you do not enroll the device in the Diagnostic Console within the first few minutes, the device will start running Apple Diagnostics. Connect a known-good wired Apple USB keyboard and a known-good wired Apple USB mouse to any available USB ports on the device. Do not use a third-party USB keyboard or mouse with either version of AST. Third-party devices may require drivers that would be unavailable in the EFI environment and may cause AST to stop responding. If the device stops responding while starting AST 2, press the device’s power button for 10 seconds to shut down, then retry. The device connects to the AST 2 cloud-based server and loads the Informed Consent dialog within several seconds. Obtain the customer’s permission to proceed with the diagnostic. Explain that only the hardware diagnostic data and Computer serial number are collected; no personal information is collected. If the customer agrees to send this information, click “I agree” to proceed. If the customer does not agree to send the hardware diagnostic data and Computer serial number to Apple, press Escape or click “Run offline” to proceed. Apple Diagnostics will run on the device as shown in the next image. If an issue is found, Apple Diagnostics produces an error code. The error code, along with a description, gives the customer more information about the issue. For more information on Apple Diagnostics, refer to articles HT202731: Using Apple Diagnostics and PH21879: Use Apple Diagnostics or Apple Hardware Test. A blue bar indicates that a device is currently online and ready for diagnostics. The device or Diagnostic Console may need the technician’s attention. For example, it may be running an interactive diagnostic like Display Anomalies, where the technician must view the device’s screen and answer a question on the Diagnostic Console before the diagnostic can proceed on to the next step. The technician has not yet viewed the device's diagnostic result. A gray striped bar indicates that the device is no longer connected to the Diagnostic Console. To remove the device from the list, click or tap on the device under test and then tap on the archive icon (file cabinet) to archive the results. Network disconnection: Check network connections, such as the Wi-Fi or the Ethernet cable. The device could also have a network issue as part of its overall issues. Try another network interface (if using wired Ethernet, try Wi-Fi; if using Wi-Fi, try wired Ethernet). Also check that Internet access is not blocked by firewalls or proxy. If the device is not connecting to the Diagnostic Console, restart the device while holding down Option-D. Also, if using Wi-Fi, note that the device must join the correct Wi-Fi network during EFI startup. AST 2 Diagnostic Suites load to the Diagnostic Console, allowing you to select which diagnostics to run. A complete list of diagnostics that are appropriate for that device will appear. i = Click or tap the info button (i) for a description or more information about the test suite. > = Click or tap the arrow button (>) to begin a diagnostic test. When you click or tap the arrow button (>), the selected diagnostic is pushed to the device and the test information is displayed on the Diagnostic Console. In the graphic below, Mac Resource Inspector (MRI) was selected and is running on the device under test. The blue progress bar indicates the time remaining to complete the diagnostic. When the diagnostic is finished, the technician view is displayed in the Diagnostic Console. Click or tap the Info button (i) next to Testing Complete to bring up the customer-shareable diagnostic results (see next step). The graphic below shows the MRI results. Note: The test results are sent to Global Diagnostic Exchange (GDX) after each test suite completes. GDX results populate within GSX. Click or tap on each icon for detailed test results. Depending on the MRI diagnostic results, you may want to continue with other test suites. Otherwise, after reviewing the diagnostic results with the customer, you can archive the device’s test results. AST 2 Diagnostics: If the device has no video, the following sequence can be taken to run AST 2 Diagnostics. AST 2 will not proceed beyond the Informed Consent dialog automatically. Press the Return key to default to English on the language select screen, then press the Return key again to agree to the Informed Consent dialog. The device will wait for instructions from the AST 2 Diagnostic Console. Press the Return key to default to English on the language select screen, then press Escape to decline the Informed Consent dialog. The device will run offline Apple Diagnostics. Shut Down: Press S, then press the Return key. Restart: Press R, then press the Return key. Seek advice from a technician if there are other tests offered and it is unclear whether they should be run. These tests should only be run by employees who are trained and authorized in this aspect of GSX. Please remember to document all test results in the SRO. AST is a simple, quick program used for diagnosing Computers that can be used by any employee. AST can run many tests, but for the front of house purposes we run two tests: Mac Resource Inspector (MRI) and Storage Diagnostic (SD). To run AST, the Computer must be an Intel Mac, and must be able to power on. If checking a portable Computer, connect the correct AC power adapter before proceeding. For a desktop Computer, connect a known-good wired Apple USB keyboard and known-good wired Apple USB mouse to any available USB ports on the Computer, which in this case, would be our AST server. Start up the Computer while holding down the N key, prompting it to start up from the Diagnostic Gateway over NetBoot. If the Computer can display an image, the familiar flashing globe will appear on the primary display, indicating that the Computer is searching for a NetBoot server. Tip: You can also press the Option (Alt) key during startup to boot into Startup Manager. Once in Startup Manager, press N to make the first NetBoot volume appear. NetBooting the computer this way allows you to verify the availability of a NetBoot server or other startup volume before continuing the startup process. Note: AST will always select and use the internal display if it can detect its presence (i.e., if connected), even if an external display is also connected. If AST cannot detect the presence of an internal display and an external display is also connected, then AST will use the external display instead as its primary (and only supported) display. Note: If AST does not load and the globe icon changes back to an Apple logo, make sure the Ethernet cable is properly seated in both the Computer and the network jack. If you are still having issues with the test loading, reset the PRAM by restarting the Computer and holding the “Command”, “Option”, “P”, and “R” keys simultaneously until you hear the Computer chime more than once, then let go. If this still does not work ask a technician to assist you during intake. If the computer's logic board has not yet had a serial number assigned, AST's Blank Board Serializer (BBS) function will appear first on the computer, instead of the AST Informed Consent dialog shown below. If this occurs, ask a technician to assist you during intake. If the Diagnostic Gateway Mac is configured and operational, and the computer can reach the Diagnostic Gateway over the LAN, the computer Mac should start up to the Informed Consent dialog within several seconds. This initial screen, shown below, verifies that you have obtained your customer’s permission to proceed running the diagnostic on his or her Mac. Only proceed if the customer has given you his or her permission to do so. Explain that only hardware diagnostic data and Computer serial number are collected. No personal information is collected at all. Note: Refer to Apple Support article TP584: COMPUTER Information Sent to Apple for complete information about what is collected and sent to Apple Diagnostic Repository (ADR). If you select Yes (or type Y on the keyboard), AST will proceed to the menu as described below. If you select Shut Down (or type S on the keyboard), AST will power down the computer being tested. Note: In case the computer has no video, note that you must use the Y or S keys to advance past this dialog. AST will not proceed beyond the Informed Consent dialog automatically. The initial screen shown here verifies that you have obtained your customer’s permission to proceed running the diagnostic on his or her Mac. When you answer Yes to the Informed Consent dialog, the AST Diagnostic Gateway menu appears (shown below), allowing you to select which diagnostic to run. As AST is further refined and developed, new diagnostics may appear in future versions. Select the “MRI – Mac Resource Inspector” test from the menu (you can use arrow keys to move the selection), and click Launch (or press Return on the keyboard) to continue. The selected diagnostic launches and runs on the computer. The MRI test is an overall scan of all the different components of the computer. Note: The display may briefly turn black, flashing text in the upper-left corner for a few seconds. This is normal behavior. MRI should launch after a few more seconds, and the display should change to white. Important: If nothing is launched from the menu within 15 seconds, AST will launch the selected triage or repair tool automatically to help diagnose COMPUTERs with “no video” issues. Note: If the COMPUTER hangs while starting AST, MRI, or any other selected diagnostic, press the COMPUTER's power button for 10 seconds to shut down, then retry. After MRI is done run Storage Diagnostics (SD). Always shut down the COMPUTER properly, using either the “Shut Down” button onscreen or the “S” key on the keyboard, after diagnostics have been launched and run from the AST menu. IMPORTANT: Do not hold down the power button to shut down the COMPUTER after AST diagnostics is finished. Shutting down the COMPUTER improperly can cause NVRAM corruption that interferes with some AST diagnostic testing sequences. Do not disconnect the Ethernet cable or Ethernet adapter from the COMPUTER until it has shut down and completely turned off. You should then disconnect the Ethernet cable from the COMPUTER before turning the COMPUTER on again, unless you plan to run other AST diagnostic tests. Once the tests finish, all items that have passed will have a green checkmark next to them. Any tests that do not pass can be clicked on in order to get further information. A red exclamation means the test has failed. A yellow exclamation point means there is a warning. For computers made between 2006 and 2008 you will use AST to run the Mac Resource Inspector (MRI) test. AST does not give the option to run Storage Diagnostics (SD) for computers made before 2009, so you will run FSCK instead. AST is a simple, quick program used for diagnosing Computers that can be used by any employee. To run AST, the Computer must be an Intel Mac, and must be able to power on. Connect the Computer via ethernet cable to one of the ethernet ports at the GeekBar. For a desktop Computer, connect a known-good wired Apple USB keyboard and known-good wired Apple USB mouse to any available USB ports on the Computer. Start up the Computer while holding down the N key, prompting it to start up from the Diagnostic Gateway over NetBoot. If the Computer can display an image, the familiar flashing globe will appear on the primary display, indicating that the Computer is searching for a NetBoot server, which in this case, would be our AST server. Restart the computer pressing and holding the Command+S keys while it boots. This will boot the Computer in single-user mode, which will provide you with a text-mode terminal. The command will run through several phases of checks. This indicates the fsck command found and fixed problems. The fsck command may find additional errors after repairing the first batch of errors, so Apple recommends you run the fsck command again if it found and fixed problems. There are no Apple Diagnostics that can be run at the GeekBar for non-Intel Macs, so you will run File System Check (fsck –yf) to help determine hard drive status or condition.